Continued. We watched several dogs, starting with Gus, who was working with the husband of the woman who had greeted us. Gus was tired, she said, because he had been bringing lambs down from the hills all week. We asked her how old he was and she said he was seven, slowing down a bit. She remarked on a veer in the path: the sheep got off the straight line and Gus ran around to bend them back again. She said that would be a small deduction, maybe a point. He made every gate, though, and the pen and the shed. There is high drama in this last part of a run. The handler is on one side of the little band of sheep, the dog on the other. Together, man and dog press the sheep into a line. The sheep want to stay together. They want to run away. They fidget. They hang undecided: bolt right or left? The dog lifts a paw and sets it down a few inches closer. The man says quietly, “Gus.” And they break down the middle! It reminds me of Donald McCaig, talking about a dog who brought a ewe who’d lost her lamb through a field of lambing ewes. It was not difficult, he says. "It was impossible." Knowing that the dog can read sheep better than any man and can react much quicker than any man, what commands would you give him? Next up was a dog named Shane. The job of going out in the first place, running full tilt in a wide arc down to that far corner, would be enough to blow the wind out of most dogs. It was how these dogs got started, lifting the four waiting sheep away from the man and dog who had set them up. Then the dogs fetch the sheep all the way back to the near corner, drive them all the way to the left, then clear across to the right gate and back in. By the time they reach the end of the course, their tongues are hanging long, but they have to be deadly quick to pull off that last couple of tasks. Look at this dog dodging for his life to split that line of sheep in two. He did it! But he had missed a couple of gates on the drive. We figured Gus was still ahead in points. When the working dog was far off, his handler would communicate with a whistle, which could be short and sharp, or long and shrill, with rising or falling inflection. When the dog got closer, the handler shifted to voice commands. “Away to me,” “come by” and “lie down.” This last was used to drop the dog, seemingly used if the sheep were agitated or moving too fast. Below: “Shane, lie DOWN!” One handler gave his commands in Gaelic. There was an element of luck: some sheep seemed to be more tractable than others. I wasn’t sure it was all luck, however. Gus wasn’t in a big hurry, and the sheep trotted right through the chute. Another fine-looking dog drove his sheep like fury, on a razor-sharp line, right through every gate, but when they arrived at the pen, they were unmanageable. I thought maybe they were too riled up from the fast pace. The dog was spectacular, but he never did get the pen. I figured Gus was still in the lead. This red dog was brilliant. The shed was spectacular; see below how it progressed. He lined them up perfectly, then split the line. That'll do! However, I think he missed an early gate. It’s possible Gus won. He wasn’t working fast, but I think he was nearly perfect. We didn’t see every dog, but Gus was the only one we saw who made every gate and the pen and the shed. He might have had a home field advantage. I gathered that he worked the flock that supplied the trial. They were in the next field over. 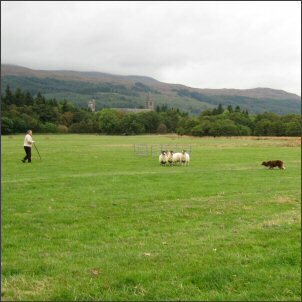 The helper man and dog in the far corner would fetch four new sheep from the flock for each new run. It sounded like Gus worked flocks all around the hills that surrounded us. Was he hired out to work other people’s flocks? Or did everybody help with each other’s flocks? None of the dogs were on leashes, except one puppy. Those who were not at their masters’ sides were watching the trials with intense concentration (like the two spectators on the left). On one run, after the shed, the two sheep on the side by the road jumped the fence and tried to run off. 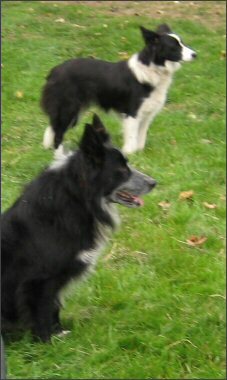 These two dogs, who had been following the action closely, took off in a flash and brought the two strays back to the fold. My, but those dogs were wonderful. By now, we were freezing cold and a misty rain was falling. We had 50 miles to drive across the North West Highlands to our hotel. So reluctantly, we climbed back in our car and left Fort Augustus behind. It was, quite possibly, the highlight of the trip.